Pyongyang, December 3 (KCNA) — The government delegation of the Democratic People’s Republic of Korea led by Foreign Minister Ri Yong Ho visited the Socialist Republic of Vietnam from Nov. 29 to Dec. 2. During the visit Ri Yong Ho paid a courtesy call on Nguyen Xuan Phuc, prime minister of Vietnam, had talks with Pham Binh Minh, deputy prime minister and foreign minister, and was invited to a welcome reception given by the deputy prime minister and foreign minister. During the courtesy call and talks both sides had an in-depth exchange of views and reached consensus on the issue of further developing the relations of friendship and cooperation between the two countries, provided and boosted by President Kim Il Sung together with President Ho Chi Minh, in various fields as required by the new era and other issues of mutual concern. With the risk of sounding like a broken record: it seems that every time a North Korean official visits or mentions another country, especially those in the region, speculation follows about whether North Korea is soon to adopt the “model” of the country in question. It’s often unclear, however, what this would mean in practice. Would North Korea simply look at one, specific country’s institutions and laws, translate them to Korean and adopt them wholesale? Would North Korea adopt the same sort of sequencing of economic reforms, in the precise order in which the country in question adopted them? Kim Jong-il, in his time, visited both Russia and China, and made comments to the effect that North Korea could learn from the countries’ economic systems. Kim Jong-un has visited not just China, but Singapore too. He may even come to Seoul before the end of 2018, and if so, he’ll likely visit construction sites and perhaps even factories operated by one or several of South Korea’s major conglomerates. The point is that North Korean government officials and policy planners, like those of all countries, will naturally look for inspiration from around the world, from whatever country may have achieved the goals that the North Korean regime aspires to. For now, that appears to be economic growth under continued one-Party rule. There are a number of countries that fit that description. Arguably South Korea does too, in a way, given that its economic growth miracle first began under harsh political oppression. There is simply little sense in debating what “model” North Korea will choose, because there is no reason to believe the country would adopt any one “model”, because that’s simply not how countries work. 평양 소식통은 26일 데일리NK와의 통화에서 “평양에서 아파트 가격이 많이 눅어(떨어)졌는데, 이상하게도 아파트 건설은 줄어들지 않고 오히려 늘고 있다”면서 “중심 구역뿐만이 아니라 낙랑구역이나 서성구역 등 외곽 지역에서도 많이 올라가고 있는데, 내가 본 것만 7개다”고 말했다. 소식통은 이어 “돈주(신흥부유층)가 돈 내고 건설해서 팔아먹는데 창전거리나 려명거리에 있는 아파트처럼 멋지게 올라가고 있다”면서 “아파트 건설은 보통 20~30명의 군인이 동원돼 건설 중이며 30층짜리 아파트도 있고 종류가 다양하다”고 덧붙였다. 이달 초 본지는 올해 6월까지 20∼30만 달러(이하 면적 230㎡)를 유지해왔던 평양의 중심지역인 중구역 및 대동강 주변 아파트 가격이 8월에 5만 달러 이상 하락한 것으로 파악됐다고 보도한 바 있다. 이처럼 아파트 가격의 폭락에도 불구하고 아파트를 건설하는 데는 신규 아파트의 경우 고가로 거래되기 때문에 투자가치가 있다고 판단하는 것으로 분석된다. 또한 지난 10년간 아파트 가격이 지속 상승, 돈주들에게 많은 부를 안겨준 점도 한몫 하는 것으로 보인다. 아울러 한반도 평화 분위기 속에 향후 대북제재가 해제되면 다시 아파트 가격이 상승할 것이라는 기대 심리도 작용한 것으로 관측된다. Despite the fall in North Korean real estate prices, apartment construction has not slowed down, report sources in the country. 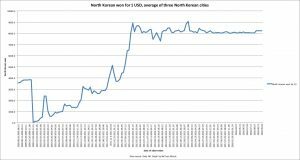 Daily NK reported earlier this month that the price of apartments in central Pyongyang, including in Jung district and those near the Taedong River, had fallen from a high of 200-300,000 dollars in June this year to around 50,000 dollars in August. However, local investors still appear keen to build the apartments because they can be sold for significant profits. According to an analysis of a North Korean construction profit-and-loss statement Daily NK obtained in April, apartments that can house 40 families (around 12-stories tall; similar to South Korean “villas”) can make a profit of around US $230,000 US dollars (around 240 million South Korean won) [from rent]. The continued rise in apartment prices over the past 10 years has helped the donju accumulate a lot of wealth, which appears to be one factor in the continued construction of apartments. And as tensions on the Korean Peninsula have dissipated, there may also be the expectation among investors in the country that international sanctions will be lifted, which would again lead to a rise in apartment prices. The dynamics at play here tells us something very interesting and important about the current state of North Korea’s economic system. For all the developments and changes over the past couple of decades, and particularly under Kim Jong-un, basic functions of a regular market economy, such as formal channels for investments, through which people can see their savings grow in value (or shrink, in bad times). In North Korea, however, private investments technically remain illegal. Housing is one area where they’ve become standard practice and more or less regularized, despite the judicial murkiness of it all. So when housing prices decline, what are people going to do, if they don’t want to keep their money laying around passively? Keep putting them into housing. After all, a lower profit is better than no profit. This dynamic can’t last forever, but as of now, the fact that investment opportunities are still relatively few may be keeping a bubble alive that already burst. Won for USD-rates on the markets, 2009–September 2018. Data source: Daily NK. Graph: NK Econ Watch. (1) Maximum pressure is not having a meaningful impact on the North Korean economy as a whole. Even though it can’t export coal, minerals or textiles under current sanctions, its main sources for foreign currency revenue, the sanctions aren’t being enforced strictly enough to impact the economy as a whole, and foreign currency keeps flowing into the economy. This explanation is pretty easy to dismiss offhand, since we know with more or less certainty that North Korea’s exports of these goods have plunged as Chinese sanctions enforcement has been fairly strict since the late summer/early fall of last year, even though it’s waxed and waned as it always does. (2) The second explanation, most notably put forward by Bill Brown, is that Pyongyang is much better at monetary policy management than they’re given credit for. Chiefly (but not solely) through decreasing the amount of won in circulation, by giving state-owned enterprises (SOEs) smaller loans and credits in won, the government is able to keep the exchange rate stabile. Speaking with my friend and colleague Peter Ward, a researcher of North Korean economic policy under Kim Jong-un and avid reader of North Korean economics journals, he explained a third possibility, partially in line with the latter hypothesis posed above. Ward visited North Korea twice in the past year, and was able to confirm many of the economic policy developments he had first detected in the literature from Pyongyang. In short, Ward’s explanation is as follows: the main holders and users of foreign exchange in North Korea are not individual citizens, but state-owned enterprises, which legally (since 2013) use foreign exchange in transactions amongst themselves. The quantities of foreign exchange held by SOEs make them, and not the foreign currency markets that individual citizens access and use, the main determinant of the market exchange rate for foreign currency. Therefore, most of the foreign currency in circulation has been there for several years, not entering or exiting monetary circulation. I asked Ward to share some of his thoughts with the readers of North Korean Economy Watch. Below is a brief Q&A of sorts. Benjamin Katzeff Silberstein (BKS): first, when did this practice of SOEs trading in foreign currency become common and legally permissive? Peter Ward (PW): probably around early 2013. This is when the “policy to make domestic production and exports one” came into force. The idea is to align domestic input prices for manufacturing, and consumer goods prices, with prevailing prices on international markets. This is literally what North Korean economics literature says that they aim to do, despite ostensibly being a socialist system in theory. 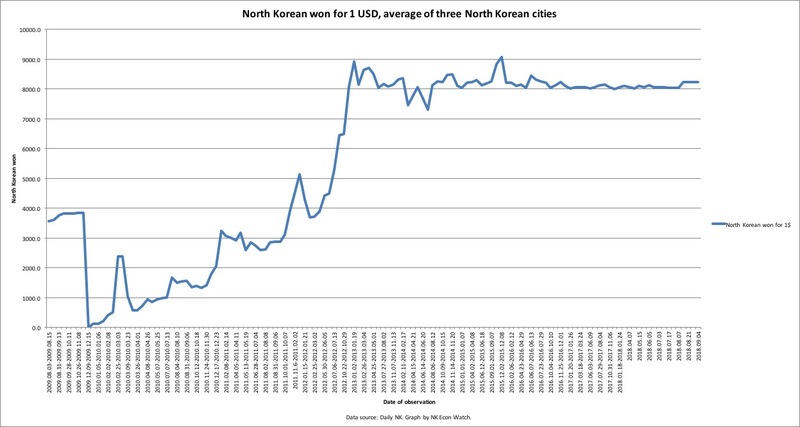 BKS: How is the FX-market price in North Korea determined? And where do the FX-market for SOEs and that for private citizens intersect? PW: We don’t know, but one could imagine that there are major foreign exchange markets in North Korea – regional markets, both markets on the ground, so to speak, and between enterprises within regions. How does the center know the prevailing price? The regional price department of the regional People’s Committee price office and market management office (they may either be separate or the same) probably simply calls the local People’s Committee, who supposedly gathers this information from the local market management offices. At any rate, there’s reporting of the prevailing local exchange rate throughout the system. Major enterprises will also know how much their inputs costs in foreign exchange, and a sense of how much their products would sell for on the world market. In that way, they’re able to assess the costs of their inputs in the world market (or at least China), and know how much they need to charge to make a profit or break even. The market for individual citizens and SOEs intersect at several levels. SOEs likely source much of their inputs from wholesale markets, and from domestic private traders. They also obtain some of their foreign exchange from loans from private individuals. Private citizens can legally lend money to SOEs, but investments in SOEs by private citizens also happen, though they’re technically not legal, and both these investments and loans probably happen quite often in foreign exchange. So the market price equilibrium happens through all these conduits, and as on any market, it is determined by countless instances of bargaining between traders, SOEs, and to a proportionally smaller extent, private citizens. BKS: so where is the FX coming from, to begin with? PW: if most inter-enterprise contracts and transactions are denominated in foreign currency, they’d be insulated from any sudden, exogenous trade shocks, such as sanctions. They’re still trading amongst themselves with whatever FX-holdings they have. For all intents and purposes, foreign currency inside North Korea is the principal legal tender – that’s what’s likely used for all major transactions inside the country, so exogenous shocks such as sanctions, from the outside, don’t necessarily impact the market price for foreign currency inside the country. BKS: Is it likely, in your view and judging from your observations in North Korea, that the government maintains a price ceiling on the market exchange rate? BKS: is it possible that China is simply helping North Korea keep the won stabile, by simply funneling RMB in? PW: that’s certainly a possibility. The North Korean government keep a very close eye on the exchange rate, both in terms of physical cash in circulation and deposits in bank accounts, which SOEs have – both domestic and foreign currency bank accounts. They’ll keep a tight control over domestic currency-denominated loans to SOEs – that’s certainly one way of doing it. State banks will probably be encouraged to denominate such loans in foreign currency. The government can also keep a pretty tight rope around money in circulation, since enterprises now have their own individual accounting system. The central government isn’t constantly borrowing money from the central bank to pump into SOEs, so the amount of money created by the central bank to lend to SOEs has gone down a lot. That, at least partially, explains how the government manages to keep domestic currency circulation down. It doesn’t look like they’re printing much money overall, I saw bills from the pre-2009 currency re-denomination being used as late as July this year. And the highest denomination of North Korean won in circulation is the 5,000 won note, which has a market value of around 60 US cents, hardly appropriate for anything more groceries. What could be better on a rainy Sunday (at least for those of us on the U.S. east coast) than to delve a little deeper into North Korea’s 2017 budget reporting? I don’t have as much time as I would wish at the moment to give the topic the attention it deserves, so I would advise readers who wish to do more research on their own to use Ruediger Frank’s previous writing on the topic as a guide to making sense of the most recent budget report (see, for example, here, and here), in combination with information about the budget report itself. Before delving into some points from the report, here’s the usual mantra about figures from North Korea: numbers should never be taken as exact, and their reliability is sketchy at best. It is impossible to tell for sure what is propaganda and what is actual, realistic information, and all figures should be taken as indicative only. The economy has grown, according to North Korea’s own figures, but by less than previous years. That is, if you take Ruediger Frank’s view that growth of state budget revenue is a proxy for overall economic growth, which went up by 4.9 from the previous year. This is significantly lower than the past few year’s estimates and results, so in a way, it’s an admission of a real decrease in economic performance. Thus, it is an admission of sorts that the economy isn’t doing all that well at the moment. There are several potential reasons for this figure (which, again, may not even be true or accurate). Recall that exports only started dropping in any drastic sense from early fall last year, when Chinese sanctions enforcement began. For 2018, the “envisaged” growth rate is much lower, at 3.2 percent. Perhaps this, too, is overtly optimistic given how difficult things seem at the moment. Or perhaps it’s a realistic anticipation of a real downturn, but no disaster. The budget report recognizes that a significant share of economic activity occurs out of the central government’s hands. Though North Korean publications do not explicitly recognize private economic activity, they’re less and less shy about talking quite openly about key facets of the marketized system. Frank pointed out previously, for example, that budgetary items such as revenues from provinces, according to some, essentially represent incomes from the non-centrally planned share of the economy. If this interpretation is correct, over a quarter of economic production (26.1%) is openly admitted by Pyongyang to be out of central planning hands. The share may well be more than the double of that in reality, depending on how you count. In any case, the budget report – and this isn’t new at all, I should point out – recognizes that a significant share of the economy is out of central government hands: “[…] 도,시,군들에서 자체의 수입으로 지출을 맞추고 많은 자금을 중앙예산에 들여놓을것으로 예견하였다 (Provinces, cities and counties are expected to balance expenditure with their own revenue and contribute lots of funds to the central budget)”. The state foresees continued growth from private and semi-private enterprise revenue next year. To see why, consider two budget posts that may appear especially peculiar for a nominally socialist economy: the social insurance fee (사회보험료수입금) and the real estate rent (부동산사용료수입금). The income from the former is expected to grow by 1.2 and 1.8 percent respectively. Revenues from the transaction tax (거래수입금) anticipated to grow by 2.5 percent. These, too, have been mentioned in previous budget reports so their appearance per se is not new. Information about what exactly they are is rather tricky to come by, and I’m grateful to my good friend and colleague Peter Ward for sending me excerpts from a 2010 North Korean dictionary (광명백과사전) on the social insurance and real estate rent fees. The social insurance fee, basically, is just what it sounds like: a fee charged from “socialist organs and factories” as well as individual worker’s earnings, to help guarantee a decent life for “people who loose their ability to work [로동능력을 잃은 사람]” as well as the elderly and others in need. The real estate usage fee is explained as a revenue from “socialist organs and factories” charged in order for the government to maintain the quality and standard of its property, i.e., its buildings and land (which technically is all the land and all the buildings in the country). In other words, this is a fee charged to enterprises in a general sense, it seems. Both the social insurance fee and the real estate usage fee are probably best thought of as general revenue streams for the government, rather than income later used for a specific purpose. The transaction tax was first mentioned in the budget report for 2011, and is most likely a form of general tax on enterprise activity. Again, these revenue flows are not new, and neither is their reporting. But fact that these revenue channels are institutionalized parts of the official economy say something about how far North Korea has gone from the Stalinist economic model, even nominally speaking. In a fully planned economy, there would be no need for fees or taxes (and indeed, North Korea claims to be a tax-free society) because all production would be planned, and its results collected in full and distributed by the state. Fees and taxes are only necessary when economic production occurs outside of state hands, which likely about half or more of economic activity in North Korea does. No reader should take this post to mean that the North Korean economy is doing well, improving, or remains untouched by sanctions. Politically, it would likely be very tough for the state to report a major downturn in a year of such scaled-up sanctions and international pressure. But the overall assessment, that things are getting tougher but are not yet catastrophic in any way, may well be accurate. The question is how long it can go on this way, and it seems to me that economic projections for 2018 may well be more optimistic than they should be. Of course, with China’s sanctions enforcement reportedly letting up in some respects, there might be more cause for optimism than we realize. In an effort to assess the implementation of the five-year strategy for the national economic development in 2017, North Korea had a meeting of the party, state, economic and military executives on December 28, Rodong Sinmun reported on the next day. At the second plenary session of the 7th Central Committee of the Workers’ Party of Korea held earlier this year, Pak said, the North Korean leader “presented a revolutionary countermeasure strategy to crumble the enemy’s despicable sanction plots into dust, and provided instrumental guidelines that have enabled us to make victorious progress in building a great socialist power.” He then listed Kim’s achievements in various areas, including the completion of the new residential complex on Ryomyong Street, progress in the development of Samjiyon County, the accomplishments in the machine industry such as the expanded production of cars and tractors, the construction of a livestock farming base in the Sepho area in Kangwon Province, and the increased production in the light industry, textile industry and fruit sector. In particular, the premier asserted, the overall material and technical basis of the economic sectors, including the power, metal and chemical industries, has been strengthened this year. “We should continue to place our top priority in putting our resources into the country’s defense industry and strengthening our self-defense capability,” he added. In fact, due to the intensified sanctions, North Korea has not been able to produce economic results as it had planned in the recent years. Neither was it able to hold the Mallima pioneers conference it had announced early last year. As international sanctions continue, in 2018 Pyongyang is expected to focus on economic development more than anything else. 올해에 우리는 영광스러운 조선민주주의인민공화국창건 일흔돐을 맞이하게 됩니다.위대한 수령님과 위대한 장군님의 최대의 애국유산인 사회주의 우리 국가를 세계가 공인하는 전략국가의 지위에 당당히 올려세운 위대한 인민이 자기 국가의 창건 일흔돐을 성대히 기념하게 되는것은 참으로 의의깊은 일입니다. We should make constant innovations and continued progress until we win the final victory of the revolution by carrying on the tradition of heroic struggle and collective innovation which adorned the founding and course of development of Juche Korea. A revolutionary general offensive should be launched to achieve fresh victory on all fronts of building a powerful socialist country by taking the historic victory in the building of the DPRK’s nuclear forces as a springboard for fresh progress. 우리는 주체조선의 건국과 발전행로에 빛나는 영웅적투쟁과 집단적혁신의 전통을 이어 혁명의 최후승리를 이룩할 때까지 계속혁신,계속전진해나가야 합니다.공화국핵무력건설에서 이룩한 력사적승리를 새로운 발전의 도약대로 삼고 사회주의강국건설의 모든 전선에서 새로운 승리를 쟁취하기 위한 혁명적인 총공세를 벌려나가야 합니다. “Let us launch a revolutionary general offensive to achieve fresh victory on all fronts of building a powerful socialist country!” This is the revolutionary slogan we should uphold. All officials, Party members and other working people should launch an all-people general offensive to frustrate the challenges of the hostile forces who are making last-ditch efforts and raise the overall strength of our Republic to a new stage of development as they brought about a great upsurge in socialist construction overcoming all difficulties through the great Chollima upswing after the war. 《혁명적인 총공세로 사회주의강국건설의 모든 전선에서 새로운 승리를 쟁취하자！》 이것이 우리가 들고나가야 할 혁명적구호입니다.모든 일군들과 당원들과 근로자들은 전후 천리마대고조로 난국을 뚫고 사회주의건설에서 일대 앙양을 일으킨것처럼 전인민적인 총공세를 벌려 최후발악하는 적대세력들의 도전을 짓부시고 공화국의 전반적국력을 새로운 발전단계에 올려세워야 합니다. 국가경제발전 5개년전략수행의 세번째 해인 올해에 경제전선전반에서 활성화의 돌파구를 열어제껴야 하겠습니다. The central task facing socialist economic construction this year is to enhance the independence and Juche character of the national economy and improve the people’s standard of living as required by the revolutionary counter-strategy put forward by the Second Plenary Meeting of the Seventh Central Committee of the Party. 올해 사회주의경제건설에서 나서는 중심과업은 당중앙위원회 제7기 제2차전원회의가 제시한 혁명적대응전략의 요구대로 인민경제의 자립성과 주체성을 강화하고 인민생활을 개선향상시키는것입니다. 인민경제의 자립성과 주체성을 강화하는데 총력을 집중하여야 합니다. 전력공업부문에서는 자립적동력기지들을 정비보강하고 새로운 동력자원개발에 큰 힘을 넣어야 합니다.화력에 의한 전력생산을 결정적으로 늘이며 불비한 발전설비들을 정비보강하여 전력손실을 줄이고 최대한 증산하기 위한 투쟁을 힘있게 벌려야 합니다.도들에서 자기 지방의 특성에 맞는 전력생산기지들을 일떠세우며 이미 건설된 중소형수력발전소들에서 전력생산을 정상화하여 지방공업부문의 전력을 자체로 보장하도록 하여야 합니다.전국가적인 교차생산조직을 짜고들며 전력랑비현상과의 투쟁을 힘있게 벌려 생산된 전력을 효과적으로 리용하기 위한 된바람을 일으키도록 하여야 합니다. The metallurgical industry should further improve the Juche-oriented iron- and steel-making technologies, increase the iron production capacity and drastically raise the quality of metallic materials in order to satisfy the needs of the national economy for iron and steel. It is necessary to ensure a preferential, planned and timely supply of electricity, concentrated iron ore, anthracite, lignite, freight wagons, locomotives and funds for the metallurgical industry. By doing so, we can fulfil next year’s iron and steel production plans and make the industry Juche-oriented without fail. 금속공업부문에서는 주체적인 제철,제강기술을 더욱 완성하고 철생산능력을 확장하며 금속재료의 질을 결정적으로 높여 인민경제의 철강재수요를 충족시켜야 합니다.금속공업부문에 필요한 전력,철정광,무연탄,갈탄,화차와 기관차,자금을 다른 부문에 앞세워 계획대로 어김없이 보장하여 다음해 철강재생산목표를 무조건 수행하며 금속공업의 주체화를 기어이 완성하도록 하여야 하겠습니다. The chemical industry should step up the establishment of the C1 chemical industry, push the projects for catalyst production base and phosphatic fertilizer factory as scheduled, and renovate and perfect the sodium carbonate production line whose starting material is glauberite. 화학공업부문에서 탄소하나화학공업창설을 다그치고 촉매생산기지와 린비료공장건설을 계획대로 추진하며 회망초를 출발원료로 하는 탄산소다생산공정을 개건완비하여야 합니다. The machine-building industry should modernize the Kumsong Tractor Factory, Sungri Motor Complex and other factories to develop and produce world-level machinery in our style. 기계공업부문에서는 금성뜨락또르공장과 승리자동차련합기업소를 비롯한 기계공장들을 현대화하고 세계적수준의 기계제품들을 우리 식으로 개발생산하여야 합니다. The coal and mineral production and rail transport sectors should make concerted efforts to make the country’s self-reliant economic foundations prove their effectiveness. 나라의 자립적경제토대가 은을 낼수 있게 석탄과 광물생산,철도수송에서 련대적혁신을 일으켜야 합니다. 특히 철도운수부문에서 수송조직과 지휘를 과학화,합리화하여 현존수송능력을 최대한 효과있게 리용하며 철도에 군대와 같은 강한 규률과 질서를 세워 렬차의 무사고정시운행을 보장하도록 하여야 합니다. A turn should be brought about this year in improving the people’s standard of living. 올해에 인민생활향상에서 전환을 가져와야 합니다. 경공업공장들의 설비와 생산공정을 로력절약형,전기절약형으로 개조하고 국내원료와 자재로 다양하고 질좋은 소비품들을 더 많이 생산공급하며 도,시,군들에서 자체의 원료원천에 의거하여 지방경제를 특색있게 발전시켜야 합니다. The agricultural and fishing fronts should effect an upswing. We should introduce seeds of superior strains, high-yield farming methods and high-performance farm machines on an extensive scale, do farming scientifically and technologically so as to fulfil the cereals production plan without fail, and boost the production of livestock products, fruits, greenhouse vegetables and mushrooms. We should enhance our ship building and repair capacities, launch scientific fishing campaigns, and reenergize aquatic farming. 농업과 수산전선에서 앙양을 일으켜야 하겠습니다.우량종자와 다수확농법,능률적인 농기계들을 대대적으로 받아들이고 농사를 과학기술적으로 지어 알곡생산목표를 반드시 점령하며 축산물과 과일,온실남새와 버섯생산을 늘여야 합니다.배무이와 배수리능력을 높이고 과학적인 어로전을 전개하며 양어와 양식을 활성화하여야 하겠습니다. 올해에 군민이 힘을 합쳐 원산갈마해안관광지구건설을 최단기간내에 완공하고 삼지연군꾸리기와 단천발전소건설,황해남도물길 2단계 공사를 비롯한 중요대상건설을 다그치며 살림집건설에 계속 힘을 넣어야 합니다. 산림복구전투성과를 더욱 확대하면서 이미 조성된 산림에 대한 보호관리를 잘하는것과 함께 도로의 기술상태를 개선하고 강하천정리를 정상화하며 환경보호사업을 과학적으로,책임적으로 하여야 합니다. Every sector and every unit of the national economy should enlist their own technical forces and economic potential to the maximum and launch a dynamic struggle to increase production and practise economy, so as to create a greater amount of material wealth. 인민경제 모든 부문과 단위들에서 자체의 기술력량과 경제적잠재력을 총동원하고 증산절약투쟁을 힘있게 벌려 더 많은 물질적재부를 창조하여야 합니다. 자립경제발전의 지름길은 과학기술을 앞세우고 경제작전과 지휘를 혁신하는데 있습니다. 과학연구부문에서는 우리 식의 주체적인 생산공정들을 확립하고 원료와 자재,설비를 국산화하며 자립적경제구조를 완비하는데서 제기되는 과학기술적문제들을 우선적으로 풀어나가야 합니다.인민경제 모든 부문과 단위들에서 과학기술보급사업을 강화하며 기술혁신운동을 활발히 벌려 생산장성에 이바지하여야 하겠습니다. The Cabinet and other economic guidance organs should work out a realistic operational plan to carry out the national economic plan for this year and push forward the work for its implementation responsibly and persistently. Positive measures should be taken by the state to ensure that the socialist system of responsible business operation proves its worth in factories, enterprises and cooperative organizations. 내각을 비롯한 경제지도기관들은 올해 인민경제계획을 수행하기 위한 작전안을 현실성있게 세우며 그 집행을 위한 사업을 책임적으로 완강하게 내밀어야 합니다.국가적으로 사회주의기업책임관리제가 공장,기업소,협동단체들에서 실지 은을 낼수 있도록 적극적인 대책을 세워야 합니다. North Korea appears to stress the importance of increasing corporate profits, an indication of a shift in its economic policies from centralized planning, according to a North Korean university’s newspaper obtained Tuesday by Yonhap News Agency. The article, titled “Establishing Way of Economic Management in Our Own Style Leads to Basis of Economic Powerhouse,” apparently lays emphasis on individual corporations’ profits becoming the financial basis for economic development, encouraging the corporate sector to make more profits. “All corporations should set up scientific strategies and management strategies of their own and ensure they have the maximum effect in their production and management activities so that they could fulfill their duties to provide the state with more profits,” the article said. This is interpreted as the North Korean economic authorities’ request that corporations focus their management activities on seeking effect and profits rather than relying on centralized planning and guided management. Since the North’s current leader Kim Jong-un came to power in 2012, the North has taken measures to achieve economic reforms aimed at expanding elements of the market economy, including the country’s new economic management system announced in June 2012. The university’s newspaper also indicated that the North has introduced a set of measures to strengthen corporations’ autonomy to its economy. Under the implementation of the measures, called “the socialist corporate responsible management system,” companies are given more autonomy than ever in their management and take care of economic problems arising from their production and management processes on their own, according to the article. But the article made sure that the ruling party will not depart from its control on the economy, saying, “In our country’s socialist system, corporations’ independent management activities are to be carried out under the guidance of the party right down the line. Cho said the North appears to support its finance by spurring corporations into increasing profits amid the implementation of U.N. sanctions aimed at halting Pyongyang’s nuclear and missile development. Here are links to the Rodong Sinmun text (English, Korean). I have not looked at them carefully, but they appear to be the same length (implying that the English and Korean versions are the same). Many outlets are focusing on the security implications of the speech, but I want to focus on the economic aspects. At the Seventh Party Congress held in May of 2016, North Korea announced a “Five Year Plan“. “Plan” was not the right English word however. It was actually a “Five Year Strategy.” This translation error was corrected in the English text of Kim’s 2017 New year Address, which correctly refers to the “Five Year Strategy”. We should concentrate our efforts on implementing the five-year strategy for national economic development. This year is of key importance in carrying out this strategy. In order to open up fine prospects for the implementation of the strategy and develop the country’s overall economy onto a higher plane, while building on the successes gained last year, we should attain the goals for this year’s struggle without fail. “Let us accelerate the victorious advance of socialism with the great spirit of self-reliance and self-development as the dynamic force!”–this is the militant slogan we should uphold in this new year’s march. We should wage a vigorous all-people, general offensive to hit the targets of the five-year strategy on the strength of self-reliance and self-development. The strength of self-reliance and self-development is that of science and technology, and the shortcut to implementing the five-year strategy is to give importance and precedence to science and technology. The sector of science and technology should concentrate efforts on solving scientific and technological problems arising in modernizing factories and enterprises and putting their production on a regular footing with the main emphasis on ensuring the domestic production of raw materials, fuel and equipment. Production units and scientific research institutes should intensify cooperation between themselves, and enterprises should build up their own technological development forces and conduct a proactive mass-based technological innovation drive, propelling economic development with valuable sci-tech achievements conducive to expanded production and the improvement of business operation and management. The electric-power, metallurgical and chemical industries should take the lead in the efforts to hit the targets of the economic strategy. The electric-power industry should carry out its production plan without fail by ensuring good maintenance of generating equipment and structures and stepping up its technical upgrading. It should run the nationwide integrated power control system effectively and organize alternated production scrupulously to ensure balance between power production and consumption; it should also develop the various sources of power to create a new generating capacity on a large scale. The metallurgical industry should introduce advanced technologies to lower the iron production cost and ensure normal operation of Juche-based production lines to turn out iron and steel in larger amounts. The state should take stringent measures to supply raw materials, fuel and power to the Kim Chaek and Hwanghae iron and steel complexes and other metallurgical factories. The chemical industry is a basis for all other industries and plays an important role in consolidating the independence of the economy and improving the people’s living standards. This sector should revitalize production at the February 8 Vinalon Complex, expand the capacity of other major chemical factories and transform their technical processes in our own way, thus increasing the output of various chemical goods. It should direct efforts to establishing a C1 chemical industry to carry out the tasks at every stage promptly and satisfactorily. The coal-mining industry and the rail transport sector should meet the demands for coal and its transport by power stations and metallurgical and chemical factories on a top priority basis. The machine-building industry should be rapidly developed. Machine factories should step up their modernization, perfect the processes for the serial production of new-type tractors, vehicles and multi-purpose farm machines, and produce and supply different kinds of high-performance and quality machinery and equipment. This year light industry, agriculture and fishing industry should be radically developed to make greater progress in improving the people’s living standards. Light industry should work out proper management strategies, regarding use of domestically available raw and other materials as their core, so as to revitalize production and bring about a turn in diversifying the range and types of consumer goods and improving their quality. It should normalize production in the mines and enterprises in the Tanchon area, so that they can prove effective in improving the people’s living standards. The agricultural front, the major thrust in building an economic giant, should raise a strong wind of scientific farming and push forward the movement for increasing crop yield. It should widely introduce seeds of superior strains and scientific farming methods, whose advantages have been proved in practice, expand the area of land under two-crop farming, and be proactive in inventing and introducing high-performance farm machines. By doing so, it can attain the production goal of grains. It should adopt measures to run the livestock farming base in the Sepho area on a normal basis and increase the production of fruits, mushrooms and vegetables, so that the people can enjoy benefits from them. The fishing sector should conduct a dynamic drive for catching fishes and push perseveringly ahead with aquatic farming. It should build modern fishing vessels in a greater number and lay out a comprehensive fishing equipment production base in the east coast area, so as to consolidate the material and technical foundations of the fishing industry. The construction sector should complete the construction of Ryomyong Street at the highest level and concentrate its forces on the major construction projects including the building of the Tanchon Power Station, modernization of the Kim Jong Thae Electric Locomotive Complex and the development of the Wonsan area. It should also build more educational and cultural facilities and houses in an excellent way. Upholding the slogan of self-reliance and self-sufficiency, every field and every unit of the national economy should launch a dynamic struggle to increase production and practise economy to the maximum, and thus carry out the plan for this year on all indices. The whole country should turn out in land administration. We should further transform the appearance of the land of our country by building modern tree nurseries in provinces, perseveringly pressing on with the forest restoration campaign and conducting river management, road repair and environmental conservation on a planned basis. In order to bring about a turnabout in implementing the five-year strategy for national economic development, it is imperative to carry on economic guidance and business management with clear objectives and in an innovative way. The Cabinet and other economic guidance organs should work out tactics to ensure the sustainable economic development by putting the overall national economy definitely on an upward track, and implement them with an unflinching perseverance. The speech itself contains nothing remarkable [to me]. There are thought to be economic adjustment measures in agriculture and enterprise management that are decentralizing authority and allowing greater economic incentives to be implemented (on an uneven basis) across the country. These policies have gone by various names: 5.30 Measures (for enterprises), 6.28 Measures (for agriculture) as well as the moniker “Our Style Economic Management Methods” or “Economic Management System in Our Style”, but whatever these policies actually are, they appear to still be unworthy of Kim’s public endorsement. As I am standing here to proclaim the beginning of another year, I feel a surge of anxiety about what I should do to hold our people in greater reverence, the best people in the world who have warmly supported me with a single mind out of their firm trust in me. My desires were burning all the time, but I spent the past year feeling anxious and remorseful for the lack of my ability. I am hardening my resolve to seek more tasks for the sake of the people this year and make redoubled, devoted efforts to this end. Previously, all the people used to sing the song We Are the Happiest in the World, feeling optimistic about the future with confidence in the great Comrades Kim Il Sung and Kim Jong Il. I will work with devotion to ensure that the past era does not remain as a moment in history but is re-presented in the present era. On this first morning of the new year I swear to become a true servant loyal to our people who faithfully supports them with a pure conscience. And I will push the effort to set up across the Party a revolutionary climate of making selfless, devoted efforts for the good of the people. As long as the great Kimilsungism-Kimjongilism is illuminating the road ahead of us and we have the single-hearted unity of all the service personnel and people around the Party, we are sure to emerge victorious. Let us all march forward dynamically towards a bright future, holding up the splendid blueprint unfolded by the Seventh Congress of the Workers’ Party of Korea to develop ours into a powerful socialist country. Pyongyang, January 3 (KCNA) — The last year was a year to be specially recorded in history as the 7th Congress of the Workers’ Party of Korea was held, Rodong Sinmun Tuesday says in an article. Last year a new milestone was laid in the struggle to further strengthen the Party and accomplish the revolutionary cause of Juche. In May last year the 7th WPK Congress was held significantly amid the revolutionary enthusiasm of all the party members, service personnel and other people throughout the country and the great interest of the world. The Conference of Chairpersons of the Party Primary Committees held last year for the first time in the history of the WPK was a meeting of significance and glory as it paved a shortcut to developing the WPK into the great Kimilsungist-Kimjongilist party and accomplishing the cause of socialism. The congresses of the youth league and the women’s union, the General Federation of Trade Unions of Korea and the Union of Agricultural Workers of Korea held in succession in wake of the 7th WPK Congress marked an epoch-making milestone in further consolidating the working people’s organizations, the transmission belts of the Party, and enhancing their militant role as required by the developing revolution in which the modeling of the whole society on Kimilsungism-Kimjongilism is pushed ahead in all spheres. Last year saw a radical turn in bolstering up the defence capabilities of Juche Korea and a turning phase brought about on all fronts for building a powerful socialist country. All the brilliant successes made by the DPRK in all fields of the revolution and construction are by no means attributable to any good conditions, nor are they a fortuitous result of any divine power. It is thanks to the experienced and tested guidance of respected Supreme Leader Kim Jong Un that the year of 2016 was recorded as a year of great turn in the development of the Party and the revolution and the struggle and life of the people. The mysterious power that brought out the epoch-making miracles and victories in the worst adversity is the result of the single-minded unity and the great self-development capability of the army and people. “Rebuilding North Korea’s Economy” is a detailed history of the evolution of North Korea’s economic institutions. It is a newly published English translation of the original Korean work. The author is a professor of political science and diplomacy at Kyungnam University. The book details how a series of crises stimulated a procession of changes in North Korea’s economic strategy. Each new strategy reacted to and attempted to amend the problems created by its predecessor. However, each policy also sowed the seeds for future crisis by creating new inefficiencies. Phillip Park’s central contribution is to correct a common misconception about marketization and the decentralization of North Korea’s economy. Park argues that North Korea did not begin its process of marketization with the July 1st Measures in 2002 – as is commonly believed. Instead, he presents evidence that North Korea actually started spinning the gears of this process much earlier, most significantly with the adoption of the Ryonhapkiopso System (Complex Industrial System) in 1986. In theory, this economic approach allowed limited market mechanisms and practical planning to replace more ideological economic initiatives. The system’s implementation was largely a response to stagnated growth and the impending collapse of one of North Korea’s key sponsor states, the Soviet Union. Aside from inefficiency, North Korea’s principal economic problem has always been striking a balance between sectors while also pursuing self-sufficiency. The Complex Industrial System aimed to address that problem. The author uses North Korean economic journals as his primary sources. He admits that separating the useful information from the propaganda was a laborious task. So, while the information does need to be taken with a grain of salt, we can still learn a lot about the state of North Korea’s economy by observing how academic discussions and policy recommendations have evolved over time. The book does a good job contrasting policy dialogues with the results of subsequent implementations (or lack thereof). The book’s sources help dispel the myth that North Korea’s political economy is purely monolithic. Indeed, through the book, we witness key players – academics and officials alike – arguing over milestone policies. One note of caution: Park dives headfirst into the North Korean understanding of economics. Yes, this means a heavy dose of Marxist concepts and five-syllable jargon. But those with a rudimentary understanding of socialist politics know that seemingly obscure theoretical points are sometimes used to justify sweeping changes. In particular, changes to North Korea’s economic institutions are often motivated by theoretical assumptions about how to best transition to a fully communist state. This is actually one of the book’s major charms. After we digest the dense vocabulary, we are presented with a reasonable framework for understanding the decision making of one of the world’s most opaque and incomprehensible dynasties. That in itself is a laudable achievement. Let’s address a few downsides. Considering that the original Korean work was published a few years ago, it would have been nice to get an expanded forward with some new observations on Kim Jong Un’s performance as an economic manager. Also, abbreviations and technical jargon are used thoroughly in the book. A glossary of terms would have been a handy reference. Although Park’s main argument may seem technical at first glance, the repercussions of this work are vast. The most immediate and profound impact is that it forces us to reconsider the history, nature, and trajectory of North Korea’s economic transformation. Marketization is typically described as a bottom-up process of slowly expanding black market activity. But Park gives us a reason to think that the picture is slightly more nuanced. It gives us a view into the thinking of North Korean economic planners. Readers are prompted to think more deeply about how institutions shape incentives in North Korea, and how these institutions have changed over time. Kim Jong Un has appealed for all energy to be put into developing underground resources in order to implement the ‘Five Year State Economic Development Strategy’ (unveiled at the 7th Party Congress of the Workers Party of Korea held in May). At the aforementioned 7th Party Congress, Kim Jong Un unveiled the ‘Five Year State Economic Development Strategy’, and also set out to revolve energy problems and strengthen the self-sufficiency and independence of the people’s economy. Since being appointed Chairman of the State Affairs Commission on June 29, an image of Kim Jong Un as ‘the leader who loves the people’ has become pronounced, with Kim visiting a Pyongyang Secondary school and a soft-shelled turtle factory. You are currently browsing the archives for the DPRK Policies category.